Peter Sellers’ Aston Martin DB4 GT up for auction! The Aston Martin DB4 GT once owned by Peter Sellers, and which starred in the actor’s 1963 comedy The Wrong Arm of the Law, is to be offered for sale by RM Sotheby’s at its London auction on 5 September. 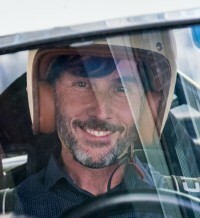 One of the highlights of the Aston’s appearance in the movie is a memorable chase scene, and Sellers – a known auto enthusiast – enjoyed driving it so much that he bought it after production finished. He sold it again soon after, but that was typical of the actor, who bought a sold a large number of vehicles during the height of his fame. The DB4 GT, chassis 0157/R, was built at Aston Martin’s Newport Pagnell factory, and returned there after filming, in March 1963, for its engine to be replaced with a 4.0-litre Lagonda Rapide block. It still retains the ’41 DPX’ registration that it appears with in the film. Will a DB4 GT Zagato break the British car price record? It was delivered new in 1963 finished in Dubonnet Red, but was repainted green for its film appearance. It’s known to have taken part in an Aston Martin Owners Club motorsport event in 1966, and went on to change colour (and ownership) a number of times. It lived abroad for several years before eventually returning to England in 1998. A year later, the car underwent a £126,000 restoration, with full engine and transmission rebuilds in addition to the body and chassis work. It’s been with its current owner since 2004. Only 75 examples of the DB4 GT – a lightweight, high-performance iteration of the standard DB4 – were built between 1958 and 1963. They had a shorter wheelbase than the standard DB4, and made use of lightweight aluminium panels. Many did without rear seats, although the Sellers' example retains the ‘occasional seats’ in the back. Felix Archer, car specialist with RM Sotheby’s, said: ‘This is an historic car that simply can’t be missed. Not only is a DB4 GT, one of the most desirable grand touring cars of the 1960s, but it’s fitting that this particular Aston Martin, with its close ties to British cinema, should become one of our headline lots at this year’s London sale. Maarten ten Holder, executive VP and head of RM Sotheby’s Europe added: ‘RM Sotheby’s boasts a tremendous track record for exceptional success in the sale of highly significant Aston Martins at auction. For further information on RM Sotheby’s London and Monaco sales, including entries for each auction and bidder registration, visit the RM Sotheby’s website.